A full bench of the Extraordinary Chambers in the Courts of Cambodia (ECCC) has found Pol Pot’s surviving henchmen guilty of crimes against humanity, and sentenced them to spend the rest of their lives behind bars. Judge Nil Nonn said a bench of international and Cambodian judges had found Nuon Chea, 88, and Khieu Samphan, 83 guilty of murder, extermination, and an array of other criminal charges partially in regards to the forced evacuation of Phnom Penh in April 1975. Similar criminal charges involving a second phase of forced population movement between September 1975 and late 1977 and the slaughter of soldiers, bureaucrats and their families from the previous Loin Nol regime were also included in Case 002/01. The packed gallery sighed with collective relief as the verdicts were read. It was an emotionally charged scene as Buddhists and Muslims – many former victims of the regime – from across the country, embraced each other. The Khmer Rouge have been blamed for up to 2.2 million deaths – either through state-planned mass executions, murder, starvation and illness. In closing arguments both men insisted they were innocent and blamed Hanoi, and Vietnamese and American infiltrators, for atrocities committed under their 1975-79 rule. The trial chamber, however, rejected those arguments and in handing down the verdict, Nil Nonn also dismissed defense attempts to justify the evacuation of at least two million people from the capital as necessary amid fears of American bombardments. “Those who did not obey or resisted were shot and killed on the spot. Without exception and in spite of the intense heat, the entire population of Phnom Penh was forced to leave, including monks, the elderly, young people, the sick and injured from the city’s hospitals, pregnant women and those who had recently given birth,” he said. Witnesses had testified that dead bodies, including pregnant women, had littered the roads out of the city during the exodus. While Nil Nonn added there was a “widespread and systematic attack” against the civilian population of Cambodia. “The attack took many forms, including forced transfer, murder, extermination, enforced disappearances, attacks against human dignity and political persecution,” he said. Dogged by controversy, particularly in the early days, it was the second trial at the ECCC. Kaing Guek Eav, also known as Duch, is serving a life sentence for the deaths of thousands of people he had processed at the S-21 torture center for extermination at the Killings Fields. Rupert Abbott the Deputy Asia-Pacific Director at Amnesty International and former Acting Head of the ECCC’s Defence Support Section said tribunal successes included the unprecedented involvement of victims of international crimes as Civil Parties and compelling Khmer Rouge leaders to confront the past and hear testimony from victims. “Notable lows include the UN walking out on negotiations for the court in February 2002, international judges threatening to resign in January 2007 over an impasse in talks on the court’s internal rules, the deaths of Ieng Sary and several suspects who were under investigation,” he said. Ieng Sary and his wife Ieng Thirith had also been charged in Case 002/02 but he died last year while Thirith has been ruled mentally unfit to stand trial. “The ECCC is delivering at least a small measure of justice to the Cambodian people,” he said. Nuon Chean and Khieu Samphan are facing additional charges of genocide in Case 002/02. Launched last week, it is expected to take another two years to complete. 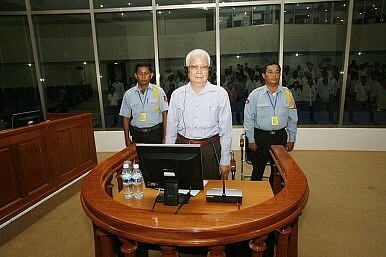 A third trial is to get underway against surviving leaders of the Khmer Rouge.